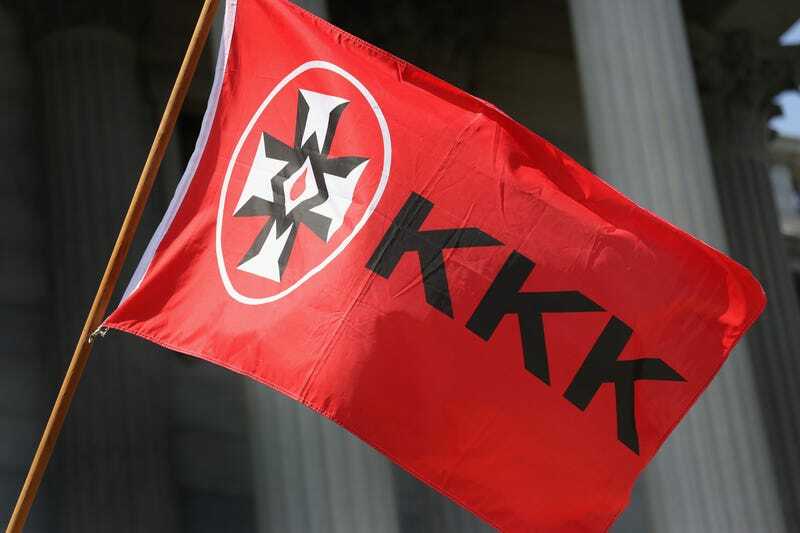 A small wooden placard with a message referencing the Ku Klux Klan was found this week in a basement classroom of the Irondale High School in Minnesota, KSTP reports. The placard, approximately the size of a Post-it note, had "The KKK wants you!" written on it, along with the image of a Klansman. A school spokesman told the news station that a handful of students discovered it and immediately reported it. The student behind the incident has also been identified. "We're dealing with the student appropriately," the spokesman said, according to the news station. According to the spokesman, the incident follows positive efforts at the school, including a Talking Circles initiative to encourage students to talk openly about race, equality and inclusiveness. Students were also encouraged to write positive notes and post them on the school's hallway walls. Just earlier this month, officials at two schools nearby—Maple Grove High School and Spring Lake Park High School—investigated racist messages found in the girls bathrooms, the news station notes. Students at Maple Grove responded by handing out snacks and positive notes to other students and painting a rock outside declaring, "Love Will Conquer All." "Words of love and care and kind things about our student body and we posted them all over the school; there was a huge turnout which was amazing and such an incredible feeling," student Syndee Hanson told KSTP.